Situé à environ une heure au sud de Houston, le Bahama Mama propose la retraite ultime pour ceux qui cherchent à se éloigner de tout pour profiter d'un temps spectaculaire à la plage. La maison a une terrasse prolongée avec de belles vues sur l'océan, et l'intérieur est très joliment meublée avec la famille en vacances à l'esprit. La plage est à quelques pas et offre des possibilités infinies pour le plaisir quelle que soit la saison. Surfside Beach a récemment été élu comme le meilleur ville balnéaire Côte du Golfe par les lecteurs du magazine Gulfscapes. Surside est ancré dans l'histoire et est le foyer de la célèbre Fort Velasco, et est l'endroit où la première bataille avant la guerre pour l'indépendance du Texas a été combattu. All was great even though it rained every day. We made the most of it and enjoyed our family! Hope next visit will be sunny and warm!! The house was perfect for all 9 of us. House is cute. 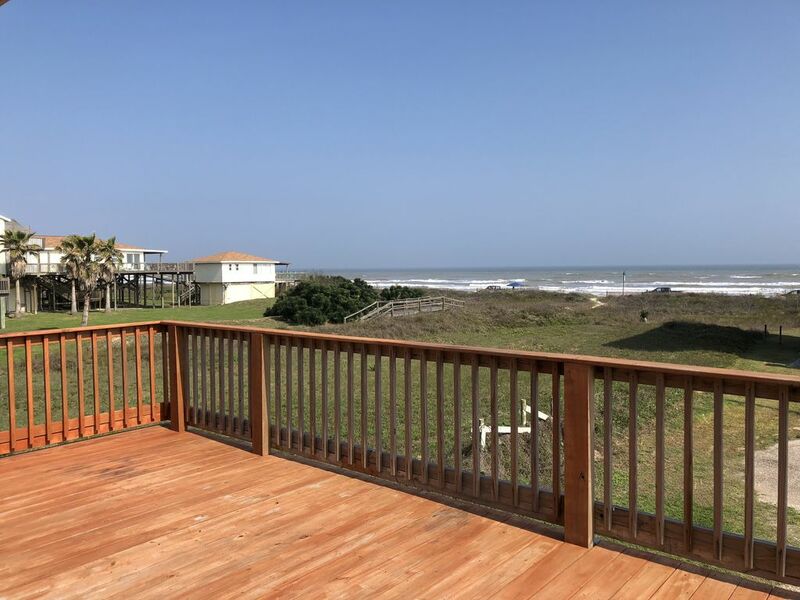 The view and beach access are great. There are some small things that if improved would take this to a 5 star rental. Pots, pans and kitchen utensils are in need of replacing, and there just aren’t a lot of pans/etc. Just felt somewhat minimal. We’ve stayed in countless rentals, and this one just seemed a bit minimal overall. No nice deck chairs to sun in, etc. There needs to be more linens and extra blankets for a more comfortable feel. Pillows need replacing and all pillows and beds should have covers for cleanliness and bug prevention. I also didn’t realize we had to make our own beds. They do provide towels and soap which was nice. This house has the potential to be truly awesome versus nice. Semi private balcony with relaxing water views. Newly upgraded floors were a nice touch. The home appears as advertised. Bonus the porch is connected to the home next door if you have a very large group and want to rent both. The only downsides were that the couches in the living room were not comfortable and the house could have been a little cleaner for my taste (bugs and dust in window sills, dusty floor, sticky handles in the kitchen). The other thing is the water in Surfside isn't great and was often brown and cloudy. We did not cook with it and there was a warning that arsenic levels in the area are high. So if that changes in the future I would definitely be back to Surfside for a visit and would be happy to stay in this house again. Thanks for your stay at the Bahama Mama! We are thrilled that you loved the new flooring. We are always on the lookout to provide a memorable experience for our guests and we use feedback to continuously improve. Guest satisfaction is our primary goal and we look forward to hosting you again. Property was great very well kept and clean. A step away from the beach with still a nice view of the beach from the deck and you could hear the waves. Don’t forget to bring a hammock if you have one because you can hook One up on the upper deck and layout at night. The hosts were very responsive and great. We would come back again for our next family trip!! Great location! Owners are very quick to respond to any needs. Great location. Great views! Easy to get to the beach! The owners responded quickly to needs. Only negative is that the entire house needs a good cleaning and could use new carpet. Plus, we found other people's hair in bathrooms and it seemed the floors were not cleaned prior to our arrival. We are glad you enjoyed the location and house! Thanks for your stay and we promise to continue to enhance the guest experience and strive for excellence always! Thanks and looking forward to hosting you again. Rates subject to change until reservation is confirmed. Minimum age for renting is 25. No Proms, Graduation parties, Bachelor parties, or Birthday parties allowed. Holidays will incur additional charge depending on number of days reserved and guest count. Submit inquiry t get exact quote. Thanks! The additional guest fee is removed if booking more than 4 nights.. submit inquiry for exact quote please. Minimum of 3 nights during summer and holidays.